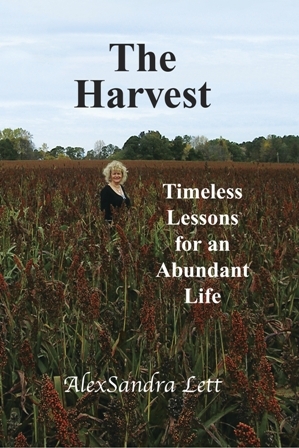 In this new book, The Harvest, Timeless Lessons for an Abundant Life, author AlexSandra Lett encourages readers to take a captivating journey through 60-plus years of living, loving, learning, working, discovering one’s true self, and honoring our natural talents. AlexSandra explores thought-provoking ideas and implements invigorating strategies to create a wonderful life filled with health, happiness, peace, and prosperity. Each chapter in The Harvest offers interesting stories, insightful reflections, lessons learned, questions to consider, and innovative approaches for enhancing every area of our lives. The book stimulates readers to listen to their inner promptings and pursue their deepest dreams. The Harvest is different from the author’s last four nostalgia offerings because she discusses the people and philosophies that motivated her to achieve success. AlexSandra shares experiences that shaped her writing, speaking, relationships, spiritual growth, health practices, artistic pursuits, entrepreneurial endeavors, and “citified” communications career. Author and speaker AlexSandra combines concepts from holistic healing with what she calls “wholistic work” to help people understand the importance of adding heart and soul to their labor as well as healing body, mind, and spirit. The Harvest was published in November and the Kindle version launched Dec. 17th on Amazon.com and ranked #10 for the self-help happiness category and later hit #5 for the women in business choices. It also appeared on two hot new release lists on Amazon. Growing crops is not for sissies…it requires planning and persistence every day of the year because sowing seeds and expecting a harvest calls for total commitment. This means working hard, maintaining faith, honoring cycles, taking risks, sharpening the saw, and functioning as a team. Running a country store involves keeping up with supply and demand to meet the needs of folks in a community…providing fuel and food and more while also offering a place for sharing stories and connecting with neighbors. Leaving the farm and starting a business takes guts and calls for a combination of charming personality, risk-taking, and unwavering belief in oneself and the products and services offered to customers. Working hard I learned lessons while growing up on a big farm in rural North Carolina from my parents who cultivated crops, raised animals, gathered tons of vegetables and fruits from our large garden, and apples, peaches, and pecans from trees in our yard. Listening intently I learned lessons at my Grandpa’s country store where he offered staples like “dranks” and MoonPies, hoop cheese, and cookies and candy from large jars on the counter. Here we took a break from constant chores and tedious hours to share stories and catch up on the latest gossip. Watching carefully I learned lessons from my favorite uncle about a burning desire and big dreams as he developed a small cabinet shop into a large building supply company. Through his attitude and actions I saw there were possibilities beyond the family farm. From many folks I learned a lot about being honest, having values, developing character, respecting traditions, cultivating a sense of humor, establishing harmonious relationships, and meeting the needs of family and others. Bountiful crops, stocked shelves, and big businesses showed me that success is possible in many different ways if we are willing to pay the price. Perhaps my greatest teachers were Mother Nature and Father Time as I discovered how to live in harmony with flavors of the fields, seasons of the year, and matters of the heart. The Creator spoke to me most when I was roaming the woods or sitting still by the pond, which inspired me to write poetry and prose. My childhood in Buckhorn community was humble, which was typical of farm life in the 1950s and 1960s where most folks owned plenty of land but were cash poor. The “citified” life attracted me with its fancy dress shops and impressive homes in suburbia. I confess that I wanted fame and fortune. Eventually I experienced notoriety through careers in the media and in marketing, and later through writing and publishing books, but there was always a longing for something more. I couldn’t find fulfillment out there in the world. Making a lot of money and providing communication services for eager clients and customers did not make me feel rich inside. Getting more attention from loyal readers and appreciative audiences convinced me that I offered entertaining and educational programs, but it was not enough. Coming home and making peace with my childhood helped for a while but also exposed wounds that needed to be healed and reminded me of truths that could not be revealed. Through the decades I shared humorous anecdotes, interesting reflections, spiritual solutions, and practical strategies with all types of people. I met the needs of others in many incarnations, but somewhere along the way I lost touch with my divine mission. While healing my body and mind of pain and trauma I also soothed my spirit and eventually began to understand that my soul was revealing a deeper purpose for my life. As I sowed seeds for growing and reaping a different me I had to go back to the beginning and fully appreciate the lessons I had learned to create an abundant life.